Named for their shape, these miniature satellites provide scientists an inexpensive opportunity to conduct experiments in space. Puerto Rico may finally see its first CubeSat launched into space, thanks to a collaboration between the Interamerican University on the island and the Florida Space Institute at the University of Central Florida. 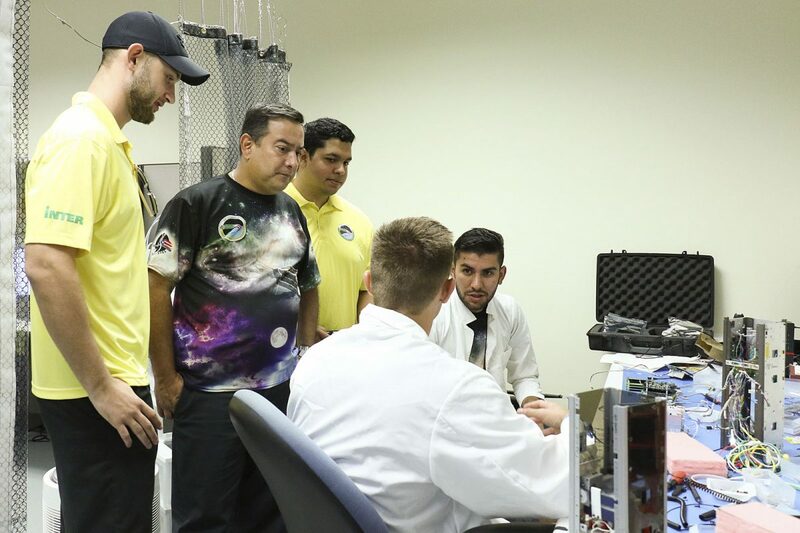 Interamerican aerospace engineering Professor Amilcar Rincon Charris and two of his students visited UCF this week to consult with UCF faculty and students about the construction of the miniature satellite called Puerto Rico CubeSat NanoRocks-2. Rincon met FSI associate researcher Julie Brisset last year after UCF became the lead organization managing the Arecibo Observatory in Puerto Rico. Brisset has worked on several NASA CubeSats by preparing payloads, such as the NanoRocks project, which flew on the International Space Station for more than a year. These satellites are compact, no bigger than a bread box. CubeSats, named for their cube shape, house experiments that look at everything from the role of dust in planet formation to determining the best kind of adhesive to use in space. These satellites now launched by private and public companies as well as NASA provide scientists an inexpensive opportunity to conduct experiments in space. For the Puerto Rican team, this partnership could mean the island’s first satellite in space, with a target launch date of 2020. This CubeSat, which will study the role of dust in planet formation, is another example of the kind of growing impact UCF is having in space research, especially when it partners with other groups across the globe. Brisset this week was awarded a NASA grant to fly an experiment aboard a flight from commercial provider Blue Origin. Assistant Professor of physics Adrienne Dove is waiting to see her CubeSat launch from California next week and physics Professor Josh Colwell has another in the final stages of completion. Currently, 15 students are working on the project. Cascante and classmate Alexander Matta, have been working on the project about five months. The team initially assembled in August 2017 after hearing about Rincon’s project, but Hurricane Maria put a stop to everything, at least for a while. UCF students are benefitting, too. Students who have worked on previous CubeSat projects have gone onto land jobs with NASA, the agency’s Jet Propulsion Laboratory and many private space companies.